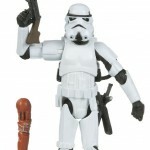 The Toyark has received some new official in and out of package images from the Star Wars The Legacy Collection line of figures. Below is a list of included figures. Click on the headline of the story to check out all of the photos.